For a long time, I had been confused about the subject of yeast. The only yeast I knew about was the little packet of active dry yeast or rapid rise yeast that I would sprinkle into my dough. But then I started collecting 19th century cookbooks and found recipes that called for “one gill of fresh yeast” among the other ingredients. Once I finally figured out what a gill was, though, (about a half a cup,) I was even more confused. I would have to use how many little instant yeast packets to equal a whole half a cup?! After doing some more research on period cooking, though, I found several recipes for how to make homemade yeast that helped to solve the mystery a bit. Most involve the use of hops or potatoes added to boiling water and flour. The problem with all of those recipes, though, is that they all call for adding “a bit of good fresh yeast” to the mixture – which was exactly what I didn’t have! And then, just a couple weeks ago, I read a book that cleared up more of the mystery for me (and solved my problem of how to make my own yeast.) The book is The Vintage Remedies Guide to Bread, written by Jessie Hawkins of the Vintage Remedies School of Natural Health. This book is a fascinating read for anyone interested in the subjects of bread, grains, gluten, modern vs. traditional bread, etc. Even once baker’s yeast became available, though, it was too expensive for some to afford and it was a gradual process for housewives and bakers to get used to this “new-fangled” way of making bread, so many cookbooks published after 1868 still include recipes that call for homemade yeast. In addition to the recipes for making yeast with hops or potatoes, I also saw several references to using “emptins” in old recipes as a leavening agent. These “emptins” or “emptyings” were just as their name implies – the emptyings of leftover dough and batter added to a crock or jar. Descriptions I’ve read about emptyings seem to be pretty similar to the flour-water mixture for a sourdough starter with scraps of extra dough added to feed the starter. The main difference I’ve seen is that several instructions for how to make emptyings call for using milk rather than water. I’m not at all an expert on the history of yeast, and this is a topic I’ve only just begun to learn about, but my guess is that “emptyings” and “sourdough” may be closely related. In all of the 19th century recipes I’ve seen and in the entire database of the Historic American Cookbook Project, I have yet to find one recipe that uses the word “sourdough,” but I have seen several recipes that refer to using a sourdough-type leavening. Once I realized that I could use a sourdough starter for the “homemade yeast” required in so many old recipes, I was immediately interested in learning how to make my own. Making my own sourdough starter had always seemed to intimidating to me, though, which, of course, is why I had been procrastinating starting one for so long. When I read The Vintage Remedies Guide to Bread, though, the process seemed a bit more simple and less intimidating. After all, people have been making sourdough starters for a long, long time without any complicated instructions for how to do it. So, I figured I might as well give it a try. Though I’ve seen many different sourdough starter recipes online, I decided to go with the simplest method of using only flour and water. Quart-Sized Wide-Mouth Mason Jars – I’d definitely recommend getting wide-mouthed ones. They make stirring the starter so much easier. Water – For best results, the water should be filtered water or spring water. Chlorine will kill the good bacteria the starter needs to survive. Day 1: Put 1/2 cup flour and 1/2 cup water into the mason jar. Mix them thoroughly together. The mixture should feel like a thick pancake batter. If it’s too thick or thin, you can add more water or flour as needed. The consistency seems to be more important than the actual measurements. Once you’ve mixed the flour and water, cover the jar with cheese cloth. Day 2: About 24 hours later (it doesn’t have to be exact), feed the starter by giving it another 1/2 cup of flour and as much water as it needs to reach the same thick batter consistency as the first day you mixed. The starter should have a few bubbles in it by this point. Stir and cover again. 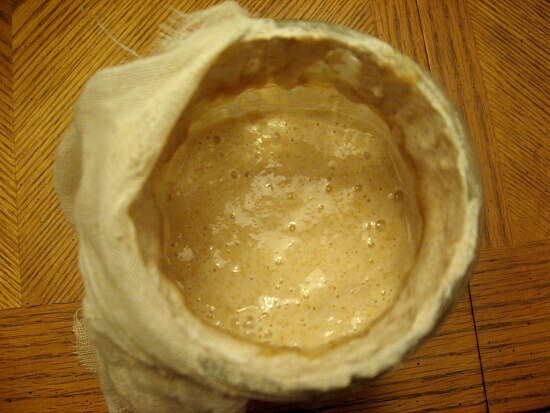 Day 3: By now, if not sooner, the starter should be looking quite a bit more bubbly, and the top might look almost frothy. Feed again the same as on Day 2, stir, and cover again. Day 4 and following: Keep feeding the starter about every 24 hours. It should look actively bubbly. By now, it might be ready to bake with. A lot really depends on the climate of where you live, the temperature inside your house, and the type of starter you have – each region has it’s own unique strains of bacteria so starters in different regions might act differently. I probably tried baking with mine a bit earlier than most instructions for making sourdough would tell you to do. I was too impatient and too excited to wait, though, so I just went ahead and baked with it. And it worked! My bread rose well enough – maybe not as well as it would have risen if I had waited a little longer, but it was still a perfectly edible loaf of bread. Bubbles starting to form after the first couple of days. Once your starter is established, you can probably get away with feeding it a little bit less. I haven’t been feeding mine every single day, and it’s still surviving fine. I’ve been using it quite a bit in different baking experiments, so I’ve kept my starter out on the counter, but if you aren’t planning to bake more than once a week, it’s best to keep it in the fridge so you don’t have to feed it as often and so it doesn’t grow to massive proportions and overflow the jar. If you keep it in the fridge, though, you just have to plan ahead and take it out the day before you want to bake and feed it to make sure it’s active enough. I was fully expecting my first experiment with sourdough to be a failure, and I was prepared to try it over again several times before I had any success, so I was incredibly surprised and happy when my starter seemed to work right the first time around! Update 10/22/13: My sourdough starter is still working well, and I’ve been using it regularly to make bread and pancakes. Update 10/17/16: My starter is still active and working well over three years later! For more information about maintaining your starter and for sourdough troubleshooting tips, check out my other sourdough posts. And, since the flavor of homemade yeast can vary depending on where you live and the particular strains of wild yeast in that area, if you decide that you don’t care for the flavor of your homemade yeast, you can also find traditional sourdough starters online to use for your homemade baking. Mine worked ! How much yeast do I add to 4 cups of flour when I make bread ? Awesome! So glad it worked for you! I usually add 1/2 a cup for 3 cups of flour, so for 4 cups of flour, I’d probably use about 3/4 cup of yeast. You might need slightly more or less depending on how active your yeast is, the time of year, temperature in your house, etc. Great !! Thank you for your guidance. I’ll try it this weekend. It sound like your yeast is very active! I’ve found that my yeast is always more active during the summer months when it’s warmer in my kitchen. If it’s warm where you live, that’s probably why your yeast rose so quickly. I can’t say for sure without actually seeing it, but it sounds like your yeast should definitely be ready to use. You also might want to feed it a bit less or a bit less often if you find that it’s always growing so quickly like that. Once the weather cools down some, you may find that the growth slows down too. Good luck with your yeast! HI i saw your question , although old I thought I would answer any way.I have been using sour dough for sometime now and it s very easy to deal with. You started it well and have it working so that is the hard part. I use a simple mason jar and punch three or four holes in the lid. I have two them and keep one clean do I can transfer the sour dough once in awhile other wise the jar can get messy. Now you need to keep it going and ready for when you need it. I keep mine in the refrigerator feeding it a bit every so often based on what I see for activity. If I leave it too long of course it produces “Hooch” or alcohol floating on the top. Just pour that off and add some more flour and water. Room temperature water from a kettle that was used for tea or what ever is perfect. I also use vegetable saved water rich in sugars and vitamins. When I want to use it I pour out what I need into a mixing bowl, add a cup of flour, a pinch of brown sugar and some vegetable water we save from cooking potatoes and carrots. I let that stand over night in a warm place covered with a damp tea towel. By morning the wee beasties are up and raring to go. This has me so excited. I’m going to make pitas soon and I’m curious about wether this yeast would be great in them. Also how much of this mixture would substitute for 1 package of store bought yeast? And if I am going to experiment with making a cake with this would I just leave out baking powder? And how much of this mix would I use in a cake? I’ve never had any experience with making pitas before, so I don’t really know how this yeast would work with them, but in general I usually use about 1/2 cup of homemade yeast for 1 package of store bought yeast. So, if you had a pita recipe that called for 1 packet of store bought yeast, you could try using 1/2 cup of homemade yeast instead. You might need to reduce the liquid amount in the recipe a bit, though, to make up for it. And as far as cakes go, it can be a bit hit or miss, so it’s definitely easier to use a cake recipe designed for sourdough yeast rather than trying to convert one, but if you don’t mind experimenting then it’s possible (just not a guarantee that it will turn out ok). The thing with cakes, though, is that the sugar content in them can keep the yeast from rising as much, so you might want to try mixing together the flour, about 1/2 cup of the homemade yeast, and some water the night before you’re planning on baking the cake to give the yeast some time to rise. And then the next morning add in your sugar and eggs and whatever other spices or flavorings your recipe calls for. And, yes, I’d probably leave out the baking powder, too. just curious. am i supposed to use all the yeast, or i can use half and continue feeding it for future use? I usually just use some of the yeast and then continue feeding it for future use. Most recipes I’ve come across tend to use about 1/2 cup of yeast, so I usually just take out half a cup and then feed the rest to use for the next time I bake something. So I didn’t “feed” my starter properly. I made bread today (day 6) and I had flat bread. 🙁 Perhaps I will remember to feed it properly this time. It can be really hard to remember too feed starters. I forget about mine all the time! I’m trying to work on setting a schedule for myself so that I remember to feed it. One thing you can try if you’re not sure if your starter has been fed enough is to add a little bit more than what the recipe calls for when you’re making bread. The other day, I wanted to make a loaf of bread, but I hadn’t fed my starter in a few days, so I was afraid it might not be active enough. The recipe I usually use calls for 1/2 cup of starter, so I put in 3/4 of a cup instead to give it a little extra rising “boost” and it worked! My experience with making bread is that too much yeast is fine, but too little doesn’t work. I once tried doubling and then tripling the amount of yeast to see what happened. It rose a little more/had more air pockets inside, but didn’t make a lot of difference. So, if you are unsure about your yeast, always use more (and note that Lori used 50% more when she was unsure of the quality). Yes, too much is definitely better than too little! 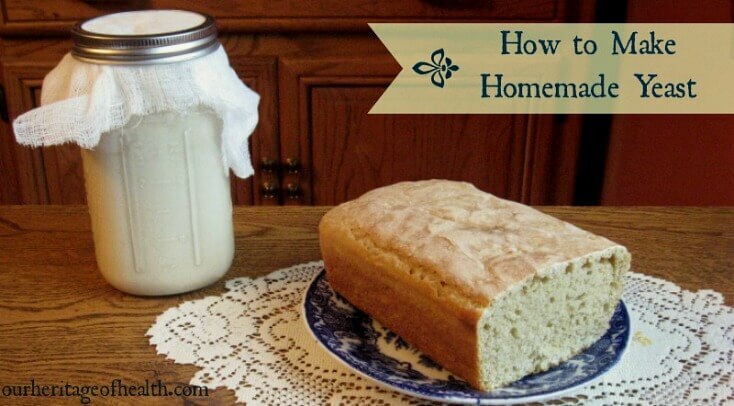 I have seen on a TV show about how the women of Kentucky had been using a bowl of mixed flours, sugar or honey, and water to make home made yeast for the baking and brewing. The woman who talked the most about it said that all it needed was the yeast from our bodies floating in the air and a warm place to slowly grow. It didn’t quite make sense to me at the time. Now I get it thank you. So many of us would like to learn more than just go buy whatever version is on sale. To be able to make our own QUALITY goods is a treasure. This is exciting, I can hardly wait to get started! Thanks for taking the time to post it! Is it possible to share the bread recipe you use? Awesome, Shantel! I hope it works out well for you! All I do is mix the ingredients together until they are well incorporated, then I knead the dough for a couple of minutes and place the dough in a greased bread pan to rise. I cover it and let it sit overnight to rise. In the summer time, it usually rises for me in about 12 hours, but in the winter time it usually takes more like 18 hours. Once the bread has risen and is light and fluffy, I bake at 350 degrees for 40 minutes. Can recipe be used in a breadmaker? No, I don’t think that would work because homemade yeast needs a long time to rise and most bread machines only have a rise time for a couple of hours. If you have a bread machine that has a long rise setting, or if you have a setting for sourdough bread, then that might work, but otherwise it probably wouldn’t. Most recipes using homemade yeast need at least 8 hours to rise, but usually it’s more like 12-18 hours, depending on the recipe. So, you can continue to feed and grow the remainder yeast for a long time? A year…forever? Yes, you can! As long as your starter remains active, you can continue using it and feeding it for as long as you want. If you go too long without feeding it, it might “die” and then you might have to just throw it out and start over, but otherwise you can keep using it indefinitely. I am gluten intolerant (or at least modern wheat intolerance — it is challenging to test) and I would love to make my own bread the old fashion way. Have you experimented with a gluten free traditional starter? Is there a type of substitute flour you recommend? I am willing to experiment and will also try using organic spelt and einkorn (if I feel sick my friends will enjoy the treat). 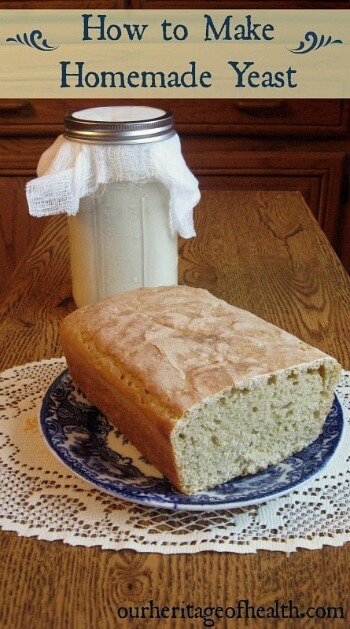 I’ve never actually tried a gluten free starter myself, but I just saw this post the other day (http://wholenewmom.com/recipes/gluten-free-sourdough-starter/) about how to make one, so hopefully that might help! Watch one of the many videos on UTube regarding baking a “No Knead” bread. It’s a method of making a bread dough by just adding about 1/8 a tsp of yeast to a dough, mixing in salt and water and just letting the dough sit and ferment for about 19 hours. As a result you get one of the best tasting breads a home baker can yield. I have actually made this bread without any addition of yeast but allowed the dough to sit for 24 hours. Bread Alone is a Bread Baking Book written by an author from upstate NY. He goes into much detail regarding sour doughs and also Polishes. In his books he talks about how there is natural yeast in the air alone. I’ll have to check that out – thanks so much for sharing! Sounds cool! Going to try it out. I was wondering how you can determine if there is mold growing on it? From everything I’ve read, it’s actually really unlikely that you’ll see mold growing on a traditional sourdough starter since the good bacterial produced by the fermentation process of the starter inhibits the growth of bad bacterial and mold. That’s also why real sourdough bread tends to just get dry and stale rather than growing mold. I’ve found that when I leave my starter for a while without using it or remembering to feed it, rather than growing mold, the top of it hardens and dries out. I simple spooned out the hardened part at the top and the rest of the starter underneath was perfectly fine. Looking through old Mother Earth News, letters section. Woman shared memory of childhood, 1812. Mashed potatoes – shaped into roll (log) about the size of silver dollar. Sliced and DRIED. (Minimal refrigeration needed for long time). One cake is yeast starter for next batch. I thought this might be of interest to you, when I read that you just scrape off the dry part. The woman did not know how the original yeast was introduced and that lack of information is what lead my search to your site. Your are an impressive person. Thank you for sharing your interests. When you let the bread rise 12-18 hours, you also leave this out on the counter? And do you cover it? Yes, I leave it out on the counter, and I cover it. It might dry out otherwise. I might be a good idea to try a recipe that’s designed for using fresh, homemade yeast for your first time using it. Since this homemade yeast is essentially sourdough yeast, any recipe for sourdough bread should work. If you want to substitute homemade yeast for active dry, you could try using about 1/2 cup of the homemade yeast in place of the active dry. You might need to adjust the amount of liquid in the recipe a bit because of the extra liquid in the yeast. Your rising times would also be different since homemade yeast has a much slower rising time than active dry yeast would. Most bread recipes made with homemade yeast (sourdough starter) call for at least about a 12 hour rising time, sometimes more and sometimes less depending on the individual recipe. The recipe I usually use is: 3 cups flour, 1 cup warm water, 1 tsp salt, 2 Tbs brown sugar, 1/2 cup homemade yeast. I mix all ingredients together and knead them well (the dough is wetter and stickier than regular bread dough, so this step can be a bit messy.) Then I put the dough into a greased bread pan, cover it, and let it rise until it has nearly doubled in size and is fluffy. In the warm weather, this usually only takes about 12 hours, but in the winter time it usually takes longer. Then once the bread has fully risen, I bake it for 45 minutes at 350 degrees. This is my favorite recipe because it is pretty simple, and it only requires one time of kneading and rising. I usually prepare my dough in the late afternoon or evening (afternoon in the summer and evening in the winter), and then I let the bread rise overnight and bake it the next morning. Yes, I think it could. You would probably need to find a pizza dough recipe that is specifically designed for homemade sourdough yeast. If you tried to substitute homemade yeast for regular store bought baker’s yeast in a recipe, it wouldn’t work, but any recipe made for sourdough yeast should work well. Continue to feed it to make it available for several weeks more, and what would I have to use in the way of ingredients? It would depend on what type of fresh yeast you would be getting. The method I talked about in this post is for a sourdough starter using only flour and water, so unless you’re buying a fresh sourdough yeast, it wouldn’t work to feed it using this same method. Before buying, I would recommend asking the store what type of yeast it is and whether or not it would be possible to feed the yeast to keep it usable for several more weeks since not all types of yeast are able to be fed and maintained like sourdough yeast is. Many thanks for your comprehensive reply;; unfortunately for me the yeast would be of the type the supermarket uses for their everyday baps and country bread etc. I shall follow your advice and speak to the staff as you suggested. I take it that your sourdough bread is in no way related to soda bread which is another method that I have used in the past. I am on my third day feeding my starting, and I think it stinks. It doesn’t smell like yeast at all? Is this normal? It does usually have a stronger smell, and it doesn’t smell like regular store bought yeast does. Homemade yeast actually varies in scent depending on where you live too, actually, since it’s created from the natural yeasts in the air. Mine has a kind of tangy sourish smell. Hi Mia, It’s hard for me to tell without actually seeing or smelling your starter, but it sounds like there’s a good chance that you were able to capture the wild yeast. Bubbles are a good sign, and the starter does usually have a kind of funny smell. Mine has sort of a tangy smell – not an absollutely horrible smell, but I wouldn’t exactly call it a pleasant smell either. One of the best ways to tell if your starter captured the yeast successfully is to try baking with it to see if the dough will rise. As far as feeding goes, once a day is probably good for a couple more days since you’re on day 4, but by the time you get to day 6 or so, the starter should be pretty well established and you can probably it back to once every other day or once every couple of days. Also should I have left it for longer at the start and how do I tell when to start feeding? Thank you for sharing this good information. I live in Indonesia with nice and warm weathers and I have sone questions. Is it possible that I am fail to make this sourdough starter if I make with regular flour ? How do I know my starter grow by good bacteria ? How to avoid bad bacteria live in my starter? What is the sign if it fail? Is it possible to add herb such as gingger or garlic to avoid bad bacteria? Sorry I ask too many questions. Thank you Lori for the answers. I have another question about the bread dough that stay overnight. Did you loose the air, cut it, put it in the pan, and grow it again before you bake it in the morning or you cut in & put it on the pan at the night ? When I make bread, I usually follow a sourdough bread recipe, and I prepare the dough the night before. I usually use 3 cups flour, 1 tsp salt, 2 Tbs sugar, 1/2 cup sourdough starter, 1 cup warm water. I mix those all together, knead the dough, and then let it rise overnight. The next morning, when it’s risen and ready to bake I put it in the oven for about 45 minutes. I start with yeast that is already active and bubbling and add it right into my dough when I’m mixing it up at night, and then the next morning all I do is put the pan in the oven. I hope that helps! How would the time between feedings change in a very hot place? I’m from Bombay, our spring is almost over with temps around 95 F. Summer will set in soon and temps will be 105-110 F on an average. Are there any visual cues to look out for so that I can feed it according to them rather than based on the timings given? I know it’s almost 3 years since this post but still hoping for a reply! Hi Nik 🙂 Yes, you’ll probably end up needing to feed your starter more often, especially during the hottest times. In the summer where I live (with temperatures usually in the 80s and 90s) I feed mine 3-4 times a week. You might need to feed yours every other day, or maybe even every day if it’s really hot. I’ve noticed with mine that sometimes in the summer time it can look a bit more watery and a thinner consistency if I don’t feed it often enough. There have also been times when it’s really warm outside that my starter has been so active and risen so much that it started to overflow the jar. If you don’t use it more than once or twice a week for baking and you find that it starts to get close to overflowing, you might need to take a few spoonfuls of it out of the jar before feeding so it doesn’t overflow when it rises. Hi. Thank you for this information. Do you have a tried and true recipe using honey rather than sugar? Hi Sarah, I’ve actually never tried using honey before. I would think it would still probably work to substitute, though, but you might need to use slightly less water. Hi Lori 🙂 No, I’ve never put a lid on my jar because that would cut off the air supply to the yeast. It might survive for a little while with the lid on, but it would eventually die. What I usually do is to use just the band of the Mason jar lid without the round center insert. So I lay the cheesecloth across the top of the jar and then screw the metal band on to keep the cheesecloth in place. A rubber band would work just as well, too, though. Very much appreciated! Thank you! We’re constantly cutting back, financially, &I’ve discovered the savings of baking bread, from one sack to a million bread products we consume daily, to include gravy… waffles, etc. The last cost affect, was yeast, & amazingly, I’m excited to try this, and see where it goes! Yes, it’s really nice to be able to save some money with making homemade bread and homemade yeast! Good luck with your yeast and bread baking. I hope it goes well! I did it! Thanks to this cite. The loaves are awesome! I ‘exclaim’ because of this: I was extremely intimidated of results; 1. my ‘starter’ did not look as frothy as yours; 2. I’d used tap water & feared I’d killed something. I gave it extra time, & was on the 6th day of the starter. Our region is in the summer session, avg. 75degrees, & I’d raised the loaves outside. Again, fearful of failure, I opted for the maximum (in addition, they didn’t look impressionable at 12hrs) 18hr rise (12 hr 1st rise, punch re-shape, 6 hr 2nd rise). Seemed a majority of the rise occurred the last few hours. Thank you, again! Hi Lori I want to make buttermilk rusks for the kids and have been wondering if I can use this recipe as a base. It’s hard to say whether that would work as a base or not since I don’t know the exact recipe you’re planing on using. Does your buttermilk rusk recipe call for using yeast? If so, it might work, but you might have to do a bit of experimenting to find out the right amount of homemade yeast to use as a substitute for the yeast in the recipe. Hi Lori, I really love this recipe. I was wondering if it is possible to dry the yeast culture after it becomes active to keep from constantly feeding it and baking. I love to bake but HOLY COW! I’ve found that it really doesn’t end up being as much of a problem as it sounds like it might be to keep feeding it. I usually only feed mine three times a week now, and I usually only bake with it once or twice a week. It takes less than five minutes to do the feeding, and I only use about a half cup of flour at a time, so it really doesn’t end up being that much. Can you start with a smaller amount, say a 1/4 cup. I don’t bake but once a week and do not want to have a large “supply” and have it go bad. I think you probably could start smaller. I’ve never tried using just 1/4 cup, but I don’t see any reason why it wouldn’t work. You wouldn’t have to worry about the yeast going bad, though. I’ve been using the same yeast for a few years now (and I usually only bake once or twice a week too) and I haven’t had any problems with my yeast going bad. The good bacteria in the homemade yeast protects it from developing any bad bacteria that would make it spoil. Thank you for this recipe. After following the instructions, I now have about 2 cups of starter. It smells good, not too strong but a little yeasty. The cat is very attracted to it for some reason – do cats like yeast? I don’t know. My question is: Due to a surplus of bread, I won’t be baking for a while. Do I need to cover it while it sits in the refrigerator? Interesting! Thanks for letting us know! Can you spelt flour to make the homemade yeast? I’ve never actually tried using spelt, but I don’t see why it wouldn’t work, especially since that was a common type of flour back before modern all-purpose flour existed, so I’m sure many of our ancestors used spelt for their sourdough yeast. One thing that I have heard, though, is that whole grain flour can sometimes cause an “off” flavor to develop in their starter, so it might be a good idea to sift out the biggest pieces of the bran if your spelt flour is whole grain. Please apologize if my question is dumb. The content which is stored in the bottle is sour dough (or) yeast right, out of which we need take out a 2 or 3 tablespoon and mix it in the wheat flour for making breads. That’s a good question, and there’s no such thing as a dumb question 🙂 Yes, the contents stored in the bottle is the homemade sourdough yeast, and if you’re making bread, you would mix that in with the rest of your flour (and any other ingredients in your recipe.) Depending on what recipe you’re using, though, you would probably need a little bit more than just 2-3 tablespoons. I usually use about a half a cup of the sourdough yeast when I make a loaf of bread. You’re very welcome! Hope it turns out well for you! Hello Thanks for sharing recipe it was really useful to make a yeas tat home as i live in warm weather i got 4 day result in 1st day yeast had bubbles and it was smelling like yeast at seems perfect then i tried making bread from it but even after 6 hours dough has not doubled please any solution for what to do now? and would it have to been better to keep feeding yeast even after it was ready at day 1 means i thought i would die if i keep it for 4 days. Thanks please tell as soon as you can i am keeping dough in warm place. My bread dough usually takes quite a bit more than 6 hours to fully rise, so it’s not unusual that your dough hasn’t doubled in size after just 6 hours. In the summer time when the weather is warm, my dough usually rises in about 12 hours. In the winter, it’s closer to 18-20 hours. I would recommend keeping your dough in a warm place for a few more hours to see if it continues to rise. If after 18-20 hours your dough still hasn’t risen much at all, then it’s possible that your yeast wasn’t quite ready to bake with yet. If that’s the case, you can keep feeding the yeast for a few more days and then try again. A couple of other things that can affect the dough rising are having too much salt or sugar in your recipe, so you could try using a little less sugar and salt. You can also try using filtered water if your water has chlorine in it because that can sometimes kill off some of the yeast and keep the dough from rising. Thank you so much for this . recently i have discovered the form of cultures being used in fleischmann’s dry yeast are saccharomyces cervacia this is toxic fungal yeast that Sakrete very harmful by-products in the form of mycotoxins and that this is actually very harmful to our bodies .it causes a great amount of candida amongst other things .trying to go back natural the way it used to be done when bread was healthy, I found it a challenge to say the least. This is the first article that actually explains how to make your own starter not having to get it from somebody else . so thank you for that have you ever made cinnamon rolls using this method? 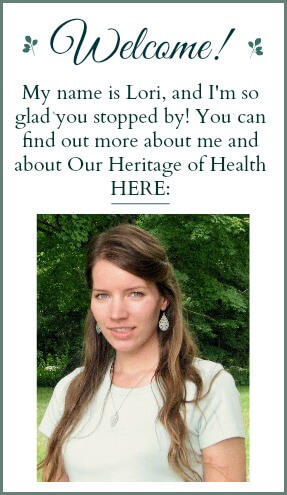 Hello and Thank you for a wonderful website! I am enjoying it. I am going to try your bread recipe listed above. I have it together and awaiting the rise. I used a mix of unbleached bread flour, all purpose flour and whole wheat flour and my ready and active homemade sourdough starter. I did use about 2/3 cup of starter and about 2 tbsp brown sugar. so with all of those changes, will see how it turns out! This is such a simple recipe, it could be made on a regular basis even with a busy work and home life. I did spend most of yesterday off and on making a complicated sourdough which came out really good and with nice complex flavors but I can’t see doing that all the time. This one is so easy, I am excited about it! I hope the bread turns out well for you! 🙂 The simplicity is the main reason why it’s my go-to recipe. I don’t have time for all of the more complicated recipes! 1) I live In India and the summer is here so I still do the 6 -7 days for the starter dough. 2) Once I use 1/2 cup for bread how do I feed the starter to store it. If I do not intend to bake for next few weeks or month, could I keep it in the fridge without feeding or do I feed once or twice a week. 3) what If i substitute 11/2 cup whole wheat flour)atta and the the rest 11/2 cup the all purpose flour would it work. I am looking forward to start on the sourdough starter and baking my own bread without a bread machine. 1) Since it’s summer where you are, it’s possible that your starter might not take quite as long to be active. I would recommend checking it every day to see how it looks. It should look bubbly and should have a tangy smell. 2) You can keep your starter in the fridge for several weeks or a month without having to feed it. If you wanted to leave it for longer than a month, then you would want to feed it once in a while to make sure it stays active. Feeding it once a month should be enough, and you would need to let it sit out to warm up a bit before feeding it because it will become very cold and stiff in the fridge. 3) Are you referring to a bread recipe in this question. If you are, then, yes, it would be fine to do half whole wheat flour and half all purpose flour. Best wishes for a successful starter and bread-making! can this yeast be used for pizza dough? Yes, it could be if you you have a recipe that calls for using sourdough yeast. Shalom! Amei sua receita de fermento caseiro! Acabei de preparar o primeiro dia. Conforme você ensinou! Quero fazer para preparar nossas chalot, pães de shabat e quero continuar usando esta receita, muito prática e simples de fazer. Cansei de ficar a mercê dos fermentos de supermercados. As vezes quero fazer pães e acabou o fermento, muito chato! Também tenho um blog, e assim, depois vou postar para minhas amigas brasileiras! Baruch HaShem! Muito obrigada! Toda haba! I love this post Lori. Please, is it right to add this sourdough yeast to a recipe with baking powder? I’ve never tried using sourdough yeast in any recipes that use baking powder before, so I wouldn’t be able to tell you from personal experience whether or not it would work ok. I have used it in a recipe that calls for baking soda before and that turned out ok, but I don’t know for sure that baking powder would react the same way. If you don’t mind experimenting a bit, though, it might be worth a try. I am fascinated by your site. and have learned things I have wondered about for so long! Thank you for taking the time to give concise and informative answers to the nice folks that have questions. Do you think that capturing wild yeast could occur better in some areas than others? Say in a valley vs. mountainous areas? You mentioned that every area has it’s own wild yeast. Have you ever found any reference for that? Again, thank you so much for your efforts. Hi Donna, that’s a really good question! So far, I haven’t come across anything that addresses whether or not there’s a difference in yeast being easier to capture in valleys or in mountainous areas. It makes sense, though, that there could be a difference since higher elevations can effect cooking times and temperatures, so it’s certainly possible that that would have an effect on wild yeast, too. I just haven’t come across any sources that reference that. I know that there’s definitely a difference in flavor in different locations and that some places, like San Francisco, have a much tangier yeast while other places have a milder yeast. I was talking recently with a historian at a living history museum near where I live in Massachusetts, and she was saying that a big part of the reason why wild sourdough yeast wasn’t as popular in New England as it was in California and other Western states was because people didn’t like the taste of the New England strains of wild yeast as much, so they would make yeast from hops or from the residue from their beer or hard cider barrels instead. Wild yeast is definitely an interesting topic to learn about! Didn’t work. Made some frothy water sorta like the picture, followed instructions to the letter. “Just bake with it.” What does that mean? How much do I use compared to an ordinary recipe? What do I do with it? I ended up substituting this ‘yeast’ into a bread recipe I made instead of packet yeast. I also doubled the weight of the ‘yeast’ included in the recipe to be on the safe side. Nothing happened. Bread didn’t rise and I now have a jar of bubbling water that I don’t know what to do with. Clearly there is some missing parts to the article which is invisible to beginners if other people have had success. TL;DR Don’t bother, find a more complete guide. I’m sorry that your sourdough starter didn’t work for you. Sometimes you don’t always successfully capture the yeast from the air the first time around and it takes a second try. And since you described your yeast as frothy water, you might need to add more flour to make it a little bit thicker. It shouldn’t be so thin as to seem watery in texture. As far as baking with your yeast, you are correct that this isn’t a complete guide. My intention was to write an article about how to make the homemade yeast, not a guide about everything you need to know about using yeast (since that would be far too long of an article), and that’s why I linked to other articles about the topic at the end. Homemade yeast isn’t always well suited to being a substitute for a packet of yeast in bread recipes. It’s best to use the homemade yeast in a recipe that specifically calls for sourdough yeast, but if you want to try substituting homemade yeast for packet yeast, you might try using about a half a cup of the homemade yeast for every packet of yeast that the recipe calls for. And for how long you have to wait to bake, once you have an established yeast starter, you don’t need to wait at all and you can bake whenever you want to. (You just want to make sure you’re feeding it with flour and water regularly, or course.) If you are making a yeast starter for the first time, though, then it will usually take about 4-5 days before the yeast is ready to use for baking. For the last few weeks Inhave been making the Mark Bittman no knead bread: 3 C flour, 1/4 t rapid rise yeast, water & salt. I mix it to incorporate, let rise (usually close to 24 hours), then dhsoe & bake. Do you think, using your posted recipe, this method would work with my (now on day three) starter when it’s ready in a few days? I can’t say for sure, but I think there’s a pretty good chance it could work. When I’m making my bread, I usually use a ratio of 1/2 cup starter to 3 cups of flour, and the rise time depends on how warm my house is. It doesn’t usually take my dough a full 24 hours to rise, but in the winter time it’s usually somewhere in the 18-20 hour range. Summertime is more like 12 hours for me. I don’t usually do much of any kneading with my dough either, so it sounds like what you’re doing is pretty similar to what I do. I want to build a local pizza yeast. The stuff i get online works but I would love fresh yeast in my pizza. Should I start with1/2 cup pizza 00 flour and maybe add some online yeast or put it outside for natural yeast? Do you add sugar? What about beer yeast…any ideas on that? Hi Rob, I know that there are people who have made pizza dough with homemade yeast, but it’s not something that I have much personal experience with. Since this homemade yeast recipe is essentially a sourdough starter, my recommendation would be to use a recipe that is for a sourdough pizza crust. Substituting homemade yeast for store bought yeast in recipes is very trial and error and doesn’t always work well. You could try it if you wanted to, but you would probably need to make some adjustments with other ingredients like the amount of liquid in the recipe, etc. So, your best bet is probably to use a recipe that is specifically designed for a homemade sourdough yeast. As far as beer yeast is concerned, I’ve never done anything with that personally, so I wouldn’t be able to give you any ideas for that myself. I’ve heard of other people making beer bread before, though, so it’s something that others might have tried and you could look into it and do some research about it if you were interested in trying to bake with beer yeast. Really? You need to quit quoting the legalese from advertisements. It really takes away from your credibility as an actual human sharing her interests with others, and makes you look like a huckster. I’m not saying you are one, just that the gratuitous disclaimer isn’t a positive thing. Don’t worry, no one is likely to mistake you for a physician. a medical device, or a drug manufacturer. You’d be surprised at the things that some people would consider to be medical advice, and my choice is always to err on the side of caution when it comes to anything legal. I’m much more concerned with that than I am about the chance that someone might consider it to be a gratuitous disclaimer. Hi. I left my yeast jar in the cupboard for over a month and forgot to feed it. Can it go off? If it’s been over a month since you’ve fed you yeast, there’s a very good chance that it’s probably “dead” now. You can try feeding it and see what happens but if it stays just flat with no bubbles at all after feeding then it’s probably not active anymore. And if it has a really bad smell (beyond the normal slightly sour tang) then I would recommend just tossing it and starting over with a new batch. 1/2 cup of flour every day, even every other day, is a lot of flour. What would you think would be the minimum amount to keep it alive and well on the counter and in the fridge? If you decide to keep it in the fridge instead of on the counter, you don’t need to feed it until you’re ready to bake with it as long as you bake somewhat regularly. If you’re going to go for several weeks of months without baking at all then you’ll want to take it out of the fridge occasionally and feed it to make sure it stays active. But if you bake once a week or once every other week, then you can just leave it in the fridge without feeding it and take it out the day before you plan on using it, allow it to thaw out a bit and warm up and then feed it to activate it again. Thanks Lori. By the way, do you always have only the cheese cloth on top or only during the initial stage ? What about when it goes in the fridge and freezer? Do you put the cap on then? Baked two sourdough last night for the first time with my own yeast and they turned out great! Big bubbles though. Wouldn’t mind if they were a little smaller. When you are keeping your starter in the fridge can you take it out, feed it and put it straight back in again or does it have to sit out for a while? And if so, how long should it sit out roughly? When you keep the starter in the fridge, it usually needs a little bit of a warm up time before you can feed it since the cold makes it stiff and hard to stir. If you’re planning on baking with it within the next couple of days, then it would be best to leave it out on the counter until you use it. But if you’re just feeding it to keep it alive for long term storage in the fridge then you would just want to let it sit out for a couple of hours to give it a chance to react to what you just fed it. Is there a way to proof the starter before using it to make sure the yeast is active? There isn’t really a way to proof it like you would do with regular yeast, but you can usually tell that it’s active by the way it looks. When my starter is active, it has visible air bubbles in it and when I stir it around it has a lighter consistency. When it’s not active, it doesn’t have any bubbles and it feels much thicker and flatter when I stir it. Thank you for this awesome article. I love baking and this starter is on my bucket to do list. I would appreciate your input on my following questions. Would putting the starter in the freezer keep the yeasts dormant so that they don’t need to be fed for many months (say you are away on a long vacation, or business), then take them out to defrost to activate the yeasts again and re-feeding them for baking? Or would freezing yeasts kill them? What else can be food for the yeast besides all purpose flour? Would oats grounded into a fine powder (with a coffee grinder or high speed blender) to have a consistency of store bought flours be food for the yeast? Can this starter be used as a substitute in recipes that calls for store bought active dry yeast or rapid rising/ instant yeast? Have you noticed the cost effectiveness of having to feed the yeasts frequently compared to buying yeasts at the grocery store? 1) Yes, you can definitely keep the yeast dormant by storing it in a cold place. The refrigerator is a good place to keep if if you’re going to go for a few weeks or possibly as long as a month without baking with it or feeding it. For longer than that, you can keep it in the freezer, but it will take some more work to bring it back to life again once you defrost it (and there is a chance the the yeast might dye off too much to resurrect it if you keep it there for a long time.) I’ve made back-ups of my sourdough starter by taking a few spoonfuls of it and adding some more flour to thicken it and then keeping it in the freezer. Once I defrosted it, though, it took several days of feeding it to make it active enough to bake with again. So, the freezer is an option, but it’s maybe not the best option. When you keep it in the fridge, it won’t take nearly as long to bring it back to life again so you can bake with it. 3) Yes, you can use this as a substitute in recipes with store bought yeast, but you sometimes have to make some adjustments to the recipe, so it can be a little bit trickier than using a recipe that’s specifically designed for a sourdough starter. I’ve found that usually about 1/2 cup of the starter is equivalent to 1 packet of store bought yeast. Since you’re adding 1/2 a cup rather than just a small packet or yeast, though, you usually have to use a bit less liquid in the recipe to make up for the difference. 4) The cost effectiveness is hard to figure since it depends on things like how often you feed your starter. If you were keeping it in the fridge a lot and not baking with it very often, then you wouldn’t be feeding it as much so it might be more cost effective. If you feed it several times a week, though, then it might end up costing a bit more than store bought yeast does (and the cost of your flour would matter too, so if you used more expensive flour than that could make the cost go up.) Since store bought yeast is fairly inexpensive, I would say that the homemade stater is probably just about as expensive (and possibly even more expensive if you feed it a lot) than the store bought yeast is.